This Water Slide Rental is a ton of Fun for adults and kids alike! This water slide rental towers at almost 3 stories tall! This slide is great for any age and can even accomodate adults. This water slide is a front loader so you can climb the stairs to the left and slide down the huge slide on the right hand side of the slide. The water slide features bright colors and tropical palm trees. 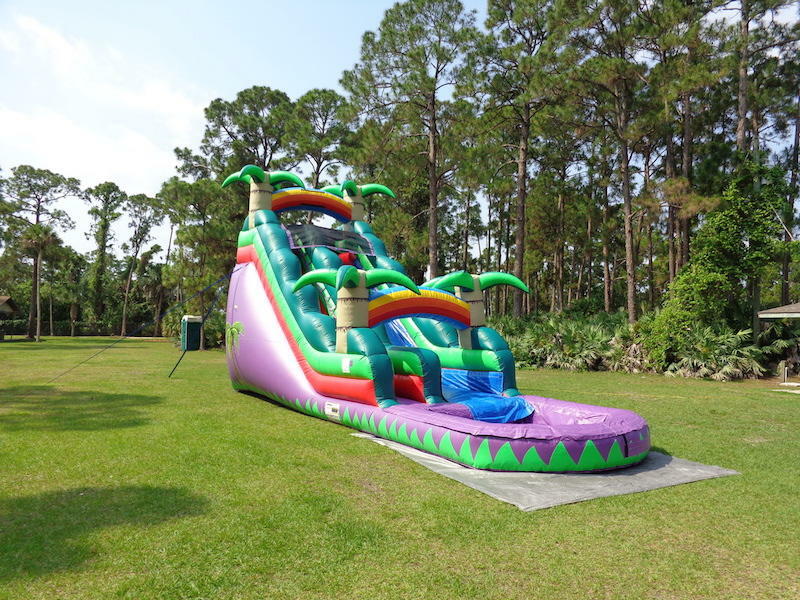 At the bottom you will experience the huge pool of this purple crush water slide rental. You will need two outlets on seperate breaker switches located within 100 ft of where the unit will be set up. Also you will need to provide a garden hose to connect into our water slide hose mister at the top. 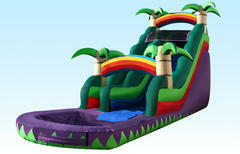 Please ensure you have a clear pathway to where we are going to set up this hige water slide rental. You will need a minimum of 48 inches or 4ft pathway clear of any obstructions.